The nondirectional time graded protection is mainly used for the radial feeders. The definite time relays are used in this method. These relays have instantaneous overcurrent relay followed by a timing relay. The contacts of the timing relay trip the circuit breaker. The basic principle used in this method is that the minimum time of operation of the relays decreases from the generating power station to the remote substation. This is possible because of definite time relays in which accurate time setting independent of C.T. saturation can be achieved. This method is shown in the Fig. 1. The Fig.1 shows the overcurrent protection of a radial feeder. For a fault beyond D, the circuit breaker as D operates first with relay time of 0.3 sec. The protections at A, B and C operates as backup protection. For faults between C and D, the relay at C trips with a time delay step of 0.5 sec. The relay at C is 0.8 sec. Thus for the section BC and AB, the time delay is successively increased. The time delay step generally lies between 0.3 to 0.5 sec. The main advantage of this method is that the time of relay at power station increases to very high value if many sections are in series. If this time is more than 2 seconds then the protection is not recommended. Hence the tripping time for the faults near supply must be limited to 2 seconds. This method is based on the principle that the short circuit current along the length of the protected transmission line decreases as the distance of the fault location increases from the power station. Thus the relays near the power station are set to trip at a progressively higher current. This is called current grading protection. The relays used are called high-set overcurrent relays. 1. It is difficult for relay to differentiate the fault on either side of a certain section, as the difference in currents is small. 2. The magnitude of the fault current can not be obtained accurately. 3. The accuracy of the relays differ in transient conditions. Hence instead of using current grading alone, inverse definite minimum time (IDMT), relays are added in the relay system. Thus the scheme becomes the combination of current and time graded protection. For differentiating the protection, the relays are set to protect only part of the feeder, generally 80% of the feeder. 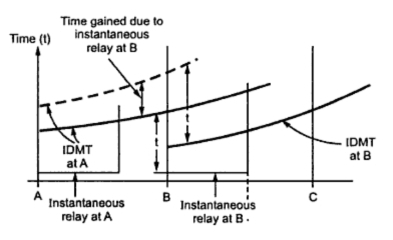 The characteristics of such combined high-set overcurrent instantaneous relay and IDMT relays are shown in the Fig. 2. For proper differentiation of operation, the instantaneous relays are set so that they do not operate for the faults beyond the protected feeder. The instantaneous element should be set for more than 150% of maximum fault current at the end of the line section which is protected by the relay. This care takes into account the effect of transients and over-reach. Where, A = Relay pick up current in steady state r.m.s. value. The overtravel is the operation of relay moving elements due to inertia, through actuating force is removed. The overtravel of 0.1 sec. is generally assumed for inverse time relays. and using PSM equivalent to maximum fault current. The relay characteristics curve called IDMT curve for TMS = 1.0 is the curve of plug setting multiplier (PSM) against the time. Thus if maximum fault current is 4000 A and relay operating current is 400 A then PSM = 400/400 = 10. Then for PSM = 10, read the time from relay characteristics for TMS = 1.0 which is Tm and using this Tm ,obtain TMS. 1. The time lag is not desirable for short circuit faults, which is provided in this method. 2. For new connections, the co-ordination of relay is difficult and require changes, in settings. 3. For long transmission lines, the method is not suitable as very rapid fault clearing is necessary in long transmission line systems. 4. Not suitable for ring mains or interconnected systems. I like your blog; you shared valuable information. We are providing more information about in power system networks; protection has to be designed such that protective relays isolate the faulted portion of the network, to prevent equipment damage, injury to operators and to ensure minimum system disruption enabling continuity of service to healthy portion of the network. Click here to visit. Relay Coordination .